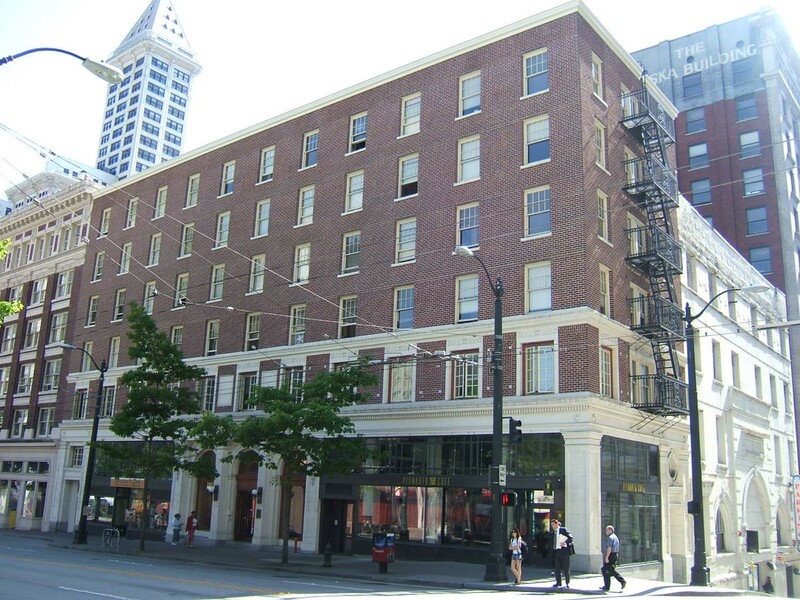 Located at the sloping SE corner of Third Avenue and Cherry Street, this six-story building was designed and constructed to serve as a 105 room hotel. It now functions as a transitional housing complex with retail businesses at the storefront level. It measures 35’ x 120’ with the hotel/apartment entry at Third Avenue. It exhibits a three-part vertical block façade composition and architectural details and decoration in the Beaux-Arts style incorporating Beaux Arts - American Renaissance stylist motifs. The steel reinforced concrete structure includes a foundation and basement. The façade is divided into three distinct zones; it is clad at the storefront level/base with terra cotta, at the second floor level with brick laid in a geometric pattern and at the shaft with brick in a common bond. The storefront level is distinguished by a central three-bay arched design feature that accentuates the hotel entrance and lobby. The building base exhibits elaborate glazed terra cotta cladding, trim and ornament including classically inspired pilasters, piers and intermediate cornice. The terra cotta-clad arcade with central entry portal is flanked by arched window bays (all include fanlight windows) and the entire element rises from a granite base and entry steps. The base design incorporates piers capped with cartouches and interlaced with ribbon swags and garlands. An intermediate cornice with denticulated moulding surmounts the base at the sill of the second floor level windows. The storefront openings include original mezzanine level windows although the display windows and door panels have been reconstructed with modern infill including marble bulkheads. The narrow second floor level band is dominated by individually set window openings with plain terra cotta surrounds and ornate terra cotta lintels. The windows are newly restored sets of six-light casement type windows. The building shaft is undecorated and dominated by unframed individually set window openings with 8/1 double-hung sash that appears to be original historic building fabric. The shaft is abruptly terminated at the roof parapet that is trimmed with wide metal coping. Original architectural plans called for an additional three floor levels, thus the intended formal cap and terminal cornice were never constructed. The north elevation includes an elaborate wrought iron fire escape and a single bay entry vestibule at the west end. This entryway incorporates ornate terra cotta surrounds and an entablature head surmounted by an oculus window. The building exhibits a particularly distinctive hotel lobby embellished with Greco-Roman-inspired decorative motifs including coffered ceilings, marble tile and terrazzo floors, elaborate arcaded wall treatments and wrought iron ornament. An elegant open marble stairwell (which interconnected this building to the adjacent opera house) includes ornate cast iron balustrades, mahogany handrails with acorn-motif finials at the newel posts. The Alaskan marble flooring and ornate plaster walls and ceiling elements were recently rehabilitated and restored. With the exception of the hotel lobby there do not appear to be any other intact or architecturally significant interior building features, finishes or public spaces. The exterior is in very good condition and has been very sensitively restored and rehabilitated. Retail storefronts and interior spaces have undergone repeated changes and were recently reconstructed. Esser, Phillip Seven. "Rector Hotel" National Register of Historic Places Registration Form, March 15, 2002.